The outdoor system is located at Rose Tree Park in Media, PA (39.9189° N, 75.3881° W), which offers a community garden to local residents. Each plot measures 20 x 25 feet, which is located in an un-shaded open space that receives lots of sunshine. The season for the system is April to November at which time it is deconstructed. 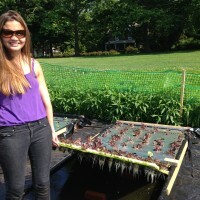 Since there was no electricity at the site, a non-circulating hydroponic system was used to grow the plants. 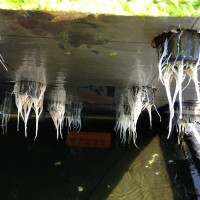 This approach’s primary advantage is that it requires no energy other than from the sun and is a variant of a floating raft water culture method. 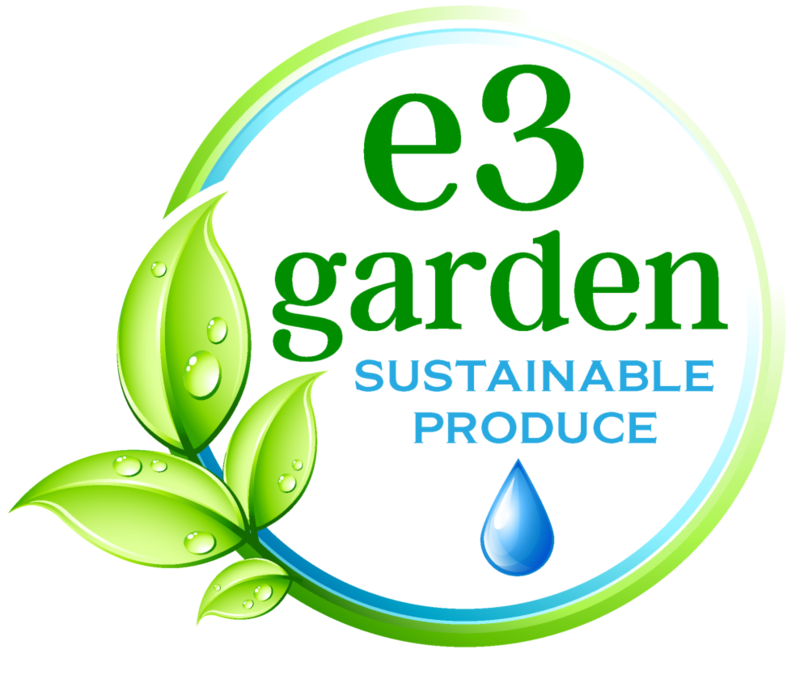 Research (e.g., Kratky) has shown that it is effective at growing leafy vegetables, herbs, and flowers. The plant roots extend into the solution even as the reservoir level drops. 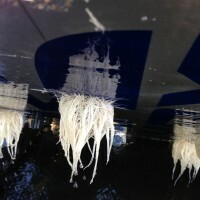 Some roots remain in the water while part of the root mass resides in the super-humid buffer region between the water level and the foam support. 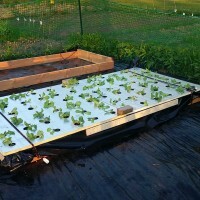 This method allows plants to grow without pumps and aeration units. 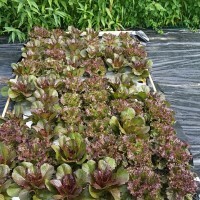 The lettuces grew extremely well in the system, reaching maturity in just 2-3 weeks. 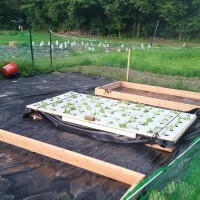 Once set up, no additional water or nutrients were added to the system. 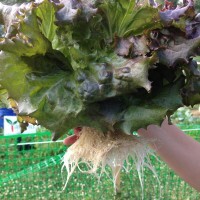 As can be seen below, both Red Sails and Rouge D’hiver lettuces show great root development, high pigmentation and extensive leaving. 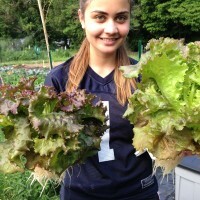 Both produced sweet tasting lettuce excellent for salads. 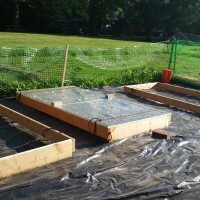 For this setup, three 4 x 8 foot raised beds were constructed using 2″ x 6″ and 2″ x 8″ lumber in order to create a reservoir of approximately 120 gallons of nutrient rich water per bed. 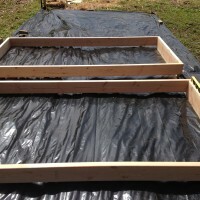 Heavy duty plastic was used to line the bed in order to contain the solution. 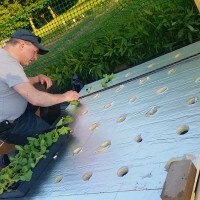 The plants were housed in net pots that were positioned in a 4 x 8 foot foam insulating board with 2 inch cutouts for the pots. There were 72 plant sites per bed (each plant is located approx. 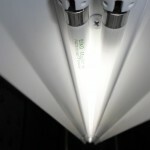 8 inches from its nearest neighbor) for a total of 216 plant sites. 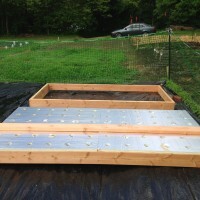 Only 96 square feet of space was used for the beds, yielding 0.4 ft2 per plant. This was only about 20% of the available space at the plot (approximately 500 ft2). 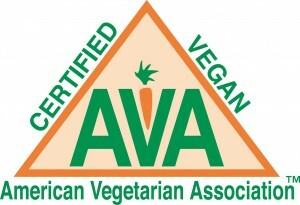 It would not be unrealistic to grow 600-700 plants at the site if production was the goal. 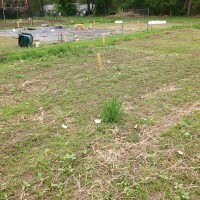 The three beds were planted with different plant types using organic seeds. 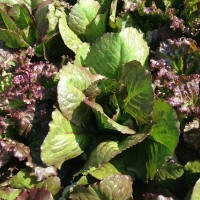 The first bed contained two varieties of lettuce including Red Sails and Rouge d’Hiver. 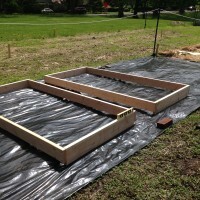 The second bed contained four different herbs including Cilantro, Chervil, Sage and Dill. 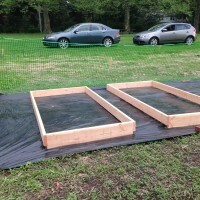 The third bed was for edible flowers and included Anise-Hysop, Marigold, and Calendula. 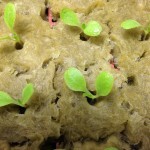 Plants were germinated inside in rockwool cubes before being transplanted to a nursery NFT system. Once sufficient root and leaf growth was present, the plants were relocated to the outdoor system. First, the ground was prepared by making sure it was smooth and level and laying down a vinyl weed block. 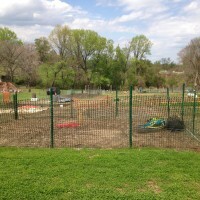 After that, a fence was installed to protect the crops from pests and animals. 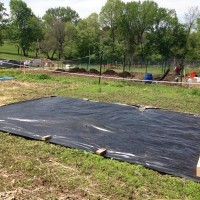 Once the ground was prepared, the raised beds were built that would hold the nutrient solution. Each bed measured 96 inches by 45 inches by 6 inches. 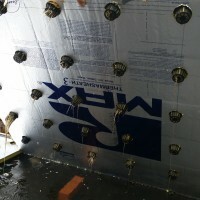 The two inch thick boards were secured with 2.5 inches galvanized wood screws. 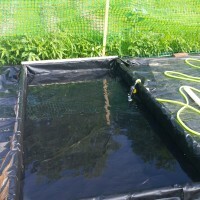 Heavy duty polypropylene was used to line the beds to hold the nutrient solution. 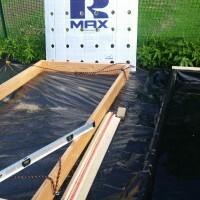 The plants were held in one inch extruded foam insulating board. Each board was cut to 45 by 45 inches. 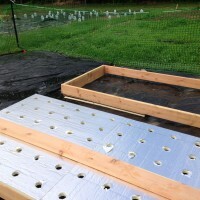 Two inch holes for the plants were spaced every 8 inches, which yielded 36 plants per board, two boards per bed for a total of 72 plants sides per bed. 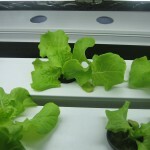 The plants were germinated indoors in one inch rockwool cubes using florescent lighting. 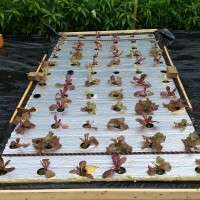 After 7 to 10 days, the seedlings were transplanted to the nursery section of a NFT hydroponic system using 2″ net pots. 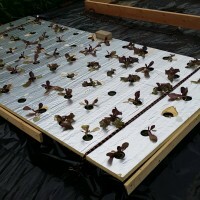 The plants were allowed to mature for one to two weeks in the NFT system to enable sufficient root and leaf growth prior to transplanting to the outdoor system. Shown below are the seedlings after having been transplanted into the outdoor hydroponic system. The nutrient solution was PH balanced to be in the range of 5.5-6.5. 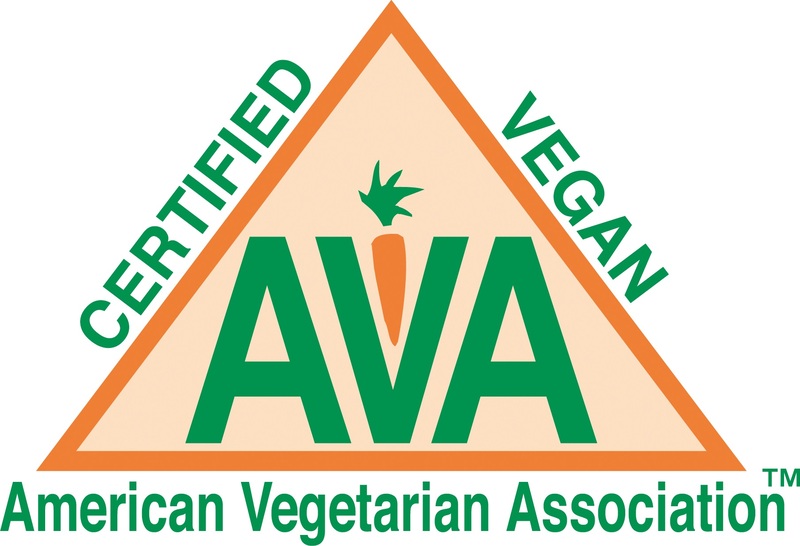 A commercial nutrient powder was used to bring the EC levels up to 1.0-1.5. After one week, the new plants showed signs of significant root and leaf development without the use of pumps and aeration units. 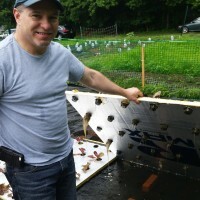 It can be noted that the initial few days in the outdoor system shocked the plants due to an over abundance of both rain and sunshine, but they were able to recover within a few days. 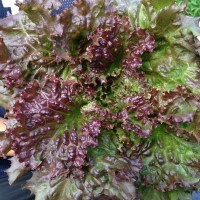 It was also observed that once the plants were in the outdoor system, the higher levels of incident light produced greater pigmentation in the leaves of both lettuces, which included Rouge D’hiver and Red Sails varieties.